A review copy was provided by the author in exchange for an honest review. All opinions are my own. 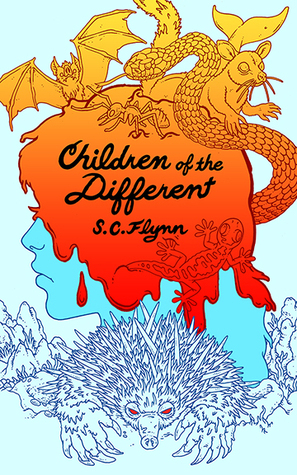 Children of the Different is the fantasy debut from author S.C. Flynn that has been making some waves around the blogosphere, and I was delighted when I discovered that it was also available in audiobook format. The reality of the busy fall season means these days I find myself with less time to curl up with book; it’s much more likely that I’m bustling around listening to one in my ear, rather than actually sitting down turning the pages. Needless to say I immediately leapt upon the opportunity to review this one, especially since I’ve been curious about it for a while. The first thing that struck me was the uniqueness of the setting. Post-apocalyptic novels are a big trend these days—especially in the Young Adult genre—but Children of the Different manages to avoid clichés and stand out with its offbeat approach. First, I really like that the book takes place in south-western Australia, in a forest where our protagonists live. Arika and her twin brother Narrah were born after “The Great Madness”, a catastrophic event that happened nineteen years ago, unleashing a brain disease that decimated the earth’s population. Curiously though, many of the survivors were those who had brain diseases or mental conditions from the world before, and came out of the Great Madness miraculously cured. Others, unfortunately, were transformed into cannibalistic zombie-like monsters called “Ferals”. And now, children born into this new reality are at risk. At the start of their adolescence, all of them must experience a trance called the “The Changing”, a process which sends their consciousness into a dreamscape. At the end of that journey, they either emerge endowed with a special mental power…or they become Feral. After the intro of this book, both Arika and Narrah have come out of their Changings, thankfully with their minds intact, but the things they saw in the Changeland have shaken them, terrified them. A malicious force known as the Echidna, or the anteater, has fixated its attention on the twins. In order to survive, the siblings will have to rely on their newfound powers, and their love for each other, to face and defeat this nebulous new threat. I’ll admit, because so much of the beginning dealt with the Changing and what our characters experienced in the Changeland, it took me a while to find my bearings and get a feel for this story. I don’t always do well with metaphysical themes in fantasy, and many of the scenes described during the dreamscape sections came dangerously close to being too weird for me to handle. My initial confusion ebbed, however, once we got past the introduction and into the meat of the story. I liked how the author linked the concept of the Great Madness and the Changing to the post-apocalyptic world, creating a premise which feels at once familiar and but also very fresh. It’s a nice blend of many genres, with themes from both sci-fi and fantasy mingling happily together, and hey, why not throw in some elements from the zombie horror genre as well, or even some survival suspense-thriller? And no doubt about it, a huge part of the book’s appeal also comes from its atmosphere. I have not been back to Australia in many years, but I still have fond memories of my visit to its cities and wilderness. While the version of Australia in Children of the Different may be a crumbling, lawless place and civilization is virtually nonexistent after the devastation of The Great Madness, S.C. Flynn still retains some of the setting’s charm in the diversity of the landscape, wildlife, and culture of the survivors. It’s worth noting as well that, even though the book’s description makes no statement whether this is an adult or YA novel, I think it would work well for both audiences. It’s true that this book stars teenage protagonists and has strong coming-of-age vibes, but for readers who are open to those themes, I think this story would have good crossover appeal. Finally, because I reviewed the audiobook, I just want to end with some comments about the narration. I’m really glad I got to experience the novel in this format, because I the narrator Stephen Briggs was absolutely fantastic. He does amazing accents for the characters, giving readers that extra layer of immersion with his performance. The production team could not have chosen a better reader for this novel, and if you are curious about checking out Children of the Different, I would highly recommend the audio edition. I thought this was a unique story as well. Even though it felt very young to me, more middle grade than YA, I enjoyed the Changeland scenes quite a bit. Yes, I thought the setting was too cool! I’ve noticed that post-apocalyptic have been a big trend lately as well. I feel like they tend to be numerous whenever it’s election season. They’re not my favorite but I do enjoy the occasional one. This one sounds interesting. I like that it has cross-over appeal and would be interested to read something with an Australia setting. I don’t think I’ve ever read a book set there. I’ll have to check it out. I also enjoyed Stephen Briggs’s performance as narrator for this book. Also, the cover is one of my favorites of the year. Agreed, Stephen Briggs’ accents were spot on. And I think it is a lovely cover too!